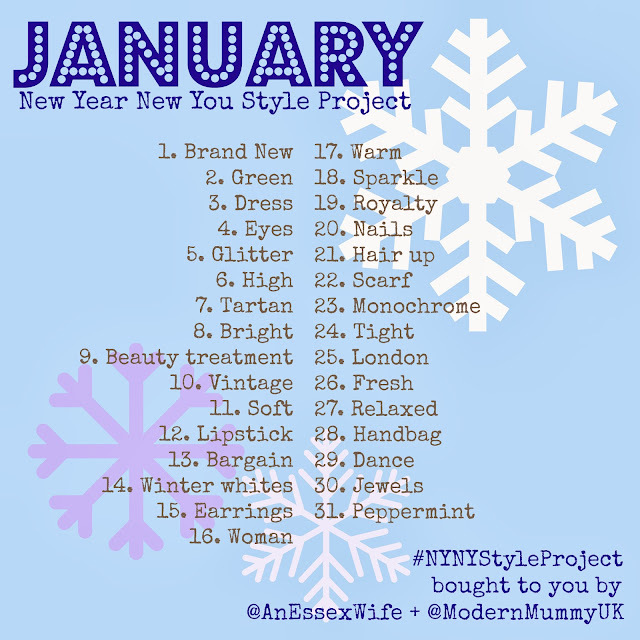 The very first list of prompts for our New Year New You Style Challenge! Are you stuck in a style rut and fed up of wearing the same things day in, day out? Do you need a bit of inspiration and motivation? Then look no further. Below is a list of daily prompts for you to take into account when planning your daily wardrobe or beauty regime throughout January! Keen to take part? It's easy! Interpret the daily prompt and incorporate it into your style. How simple is that! Next up, take a photo and share it - it's a fantastic way to encourage and inspire others - and don't forget to use the hashtag #NYNYStyleProject so that everyone can see your images. If you're sharing via a blog then feel free to leave a link to your post in the comments below. We are SO excited to be launching this feature and hope you all enjoy it. In the meantime, I'm signing off for the festive period - have a fabulous Christmas and we'll see you in the New Year! What a great idea, thank you! My New Years resolution this year is to make the best of myself, this will really help!